We’ve all heard to eat right and exercise our entire lives. It’s really that simple, yet, according to the Centers for Disease Control and Prevention, the percent of adults age 20 years and over who are overweight is 69% The percentage of Americans who are obese is 36%. If it’s so simple then why are these numbers so staggering? Well, because it’s simple, but it’s not easy. Like many people who begin taking bipolar medications I gained weight. In fact, the meds I take increase appetite AND reduce metabolism. Not a good combination. It’s frustrating and perhaps even maddening at times. Sadly, I’ve known some who have stopped taking their meds as a result. Now, I’m not kidding myself, I’ve had a weight problem since I was a kid. However, when I first began treatment for bipolar disorder my weight skyrocketed. I’m a short guy – Only 5’5″ tall, but when I started writing this blog in 2008 my weight was 293 pounds. I had expected that to be my max. Being open and honest on this blog would be my catalyst to give me the motivation to start losing weight. I was wrong. I gained 10 more pounds and maxed out at 303. I was stuck there for several years. 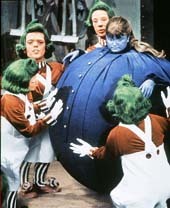 In “Willy Wonka and the Chocolate Factory,” Veruca Salt was the girl who turned into a big round blueberry. That’s what I looked like, or at least how I felt I looked. Well, I didn’t think my skin color was blue, but I sure felt that big and round. My doctor sent me to a gastro-bypass surgeon, but, when the procedure was explained to me I wanted no part of it. Having my intestines detached from my stomach, then having my stomach cut and rearranged, then having my intestines reattached, was too disgusting to consider. In addition, in order to have the surgery, patients are required to lose 10% of their body weight. My thought was that if I could lose 10% of my weight, then why the hell would I not just keep going. I decided to join Weight Watchers instead. It was through Weight Watchers that I’ve lost 90 pounds. I went from 303 pounds down to 213. Sure, I have a long ways to go, but I’m ecstatic at my progress so far. I did gain some of the 90 pounds back, about 10 pounds, but I refused to let that dissuade me. I persevered and am currently working to get back to that 90 pound loss and continue forward. Currently my weight is 218. There are other weight loss programs out there, but with Weight Watchers I don’t have to buy disgusting foods. What does anyone learn from that type of program? Do they plan to buy those packages of food the rest of their life? There’s also the Cabbage Diet, the Dolly Parton diet, the Onion Soup diet, the Baby Food diet, the Grapefruit Diet, etc. etc. etc. Many of these help to loose weight, but once you go off of them most people gain all their weight back, and a very large number of them gain back more weight than where they started. What makes Weight Watchers so successful? Well, let’s go back to my earlier comment that maintaining a healthy weight is simple but not easy. That’s what Weight Watchers is all about. Through Weight Watchers you learn how to ear right. Most of it we know, but they reinforce it. And then there’s exercise. When I was at 303 pounds I could barely walk. There is a supermarket directly across the street from us and I could not walk there without having to stop at least four times to get my sides to stop hurting and to catch my breath. It was demoralizing. Compare this to one day last week in which I walked 11 miles and enjoyed it. The two big wins you get from WW is accountability and support. The accountability is the weekly weigh in. Believe it or not, I look forward to that every week. I look forward to it even on weeks where I think I may have gained. I have the belief that I can’t move forward unless I know where I am and that’s why I look forward to the weigh ins. Your weight and/or weight loss is not shared with any other members unless you would like to have it shared. Then there is support. This is the big win with Weight Watchers. The leader of the meeting Maurice and I go to each week is outstanding. In fact, the entire staff is amazing. Lots of love and support. In addition and very important, support also comes from other WW members. Having people applaud when you have lost 5 pounds is extremely motivating. They are excited when you lose and supportive when you gain. There is no other program out there that is as rewarding, at least not from my perspective. So, the big question is, do I work for Weight Watchers? Nope, I don’t. I’m just grateful for having found a program that makes me look better, makes me feel better, and in all likelihood, helped to save my life. Big congratulations on your weight loss! I, too, struggled with my weight, more so after being put on medication. I did Weight Watchers about four years ago and lost 60 pounds, but injured my knee while exercising and then could no longer exercise. Depression set in and we all know where it goes from there. Right now I am not at a point financially where I can afford the WW fees (even though I know they aren’t that bad). I am trying to do it on my own, along with DSB, and it is just so darn hard. That is great that Maurice is helping you along your journey. So very happy for you! I wish you the best, Rose, on your weight loss journey. I know WW can get pricey over time. I’m unfamiliar with DSB. What is that? I recently read in a book on Willpower by Roy F Baumeister that it took required resources of labor from hundred of farmers, gardeners, butchers, fisherman, hunters and cooks and other servants to keep Henry the VIII as big as he was. Today poor people can eat as well. The trouble is that food is everywhere and because through most of history food was scarce evolution has made us want to eat and we store fat. But today, unless we are the lucky few with the right metabolism, it does not work. Don’t ever blame someone who is heavy for lack of will power or being lazy, they need a new strategy. Look at Oprah Winfrey, extremely ambitious and hard working, but she still struggles mightily. ” Don’t ever blame someone who is heavy for lack of will power or being lazy, they need a new strategy. ” I couldn’t agree with you more, Stan. I may have just found a new book to download to my Kindle. I SOOOO wish weight watchers had worked with me. I watched you and Maurice and others I know and was so excited to do it too. Stuck to it dillegently and after 9 weeks had .a 2 net – honestly can’t recall if that was up or down, but with .2 it doesn’t really seem too important. But I know so many people for whom it has worked, and worked long term. It’s clearly a terrific program. I’ve lost weight before on my own and when I get my new knee I hope to do so again – wish me luck! By the way Brad – you totally rock. Great guy, great blog. Wow. Thank you Lora. You make me blush. What a great success story! Keep up the great work…it’s truly inspiring! Thank you for your kind words, Michele. I must admit it inspired me just writing it.